The strength of our Democracy depends on you. Join us. Get involved. We were blown away by the love our supporters showed the League during The Big Share last year. That love comes from a passion for the League’s mission to empower voters and defend democracy. 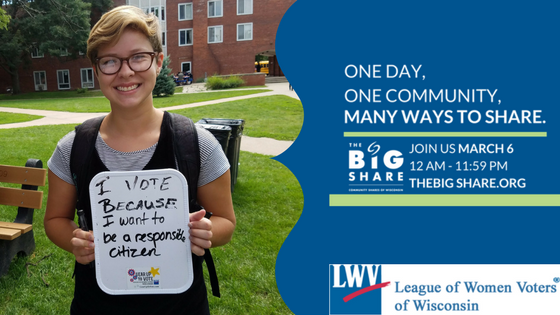 With The Big Share only one week away, we know we can count on you to make even more of an impact this year. We’ve set a lofty goal to raise $15,000 during our Big Share campaign. And thanks to a generous matching grant from the Brookby Foundation, we’re on our way to meet our goal, but we need you on our team to get the rest of the way there! Please be our champion, and make sure we reach our goal. During the Big Share, your donation will be matched dollar for dollar up to $7,825. For every $1 you give, the League will receive $2. This is a great opportunity to make your dollars stretch even further for a cause you believe in. Show your love of the League with a donation of $25, $50, $100, or whatever amount you’d like. Every little bit counts for the big day! We can’t wait to celebrate the difference your generosity will make on March 6th! If you’re like us and can’t wait to share your love for the League, you can make your contribution today! All money raised between now and the end of the day on March 6th will count towards the League’s Big Share total. 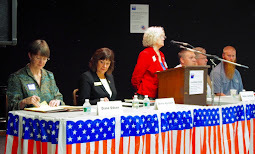 Chair Marilyn Chesnik speaks at candidate forum. To receive posts via email, enter your email address in the space below and submit. Look for an email from Feedburner and click on the verification link to complete the process. You can cancel your subscription at any time. Your email address will not be used in any other way. LWV Upper Saint Croix Valley 2016. Picture Window theme. Theme images by merrymoonmary. Powered by Blogger.